Cisco Collaboration Meeting Rooms (CMR) Hybrid brings together world class video conferencing solutions with scalable WebEx web conferencing services to provide your organisation with an exceptional communication experience, wherever you are, on whatever device you choose. With Cisco CMR Hybrid, your organisation can provide video for everyone, enhancing productivity, accelerating sales cycles and greatly reduce time to market. So what makes the Cisco CMR Hybrid? 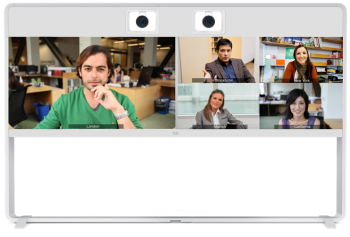 Cisco CMR Hybrid utilises the best of both worlds – an on-premise deployment of powerful infrastructure and a cloud deployment of WebEx Meeting Centre – to provide a fully encompassing video, audio and data collaboration solution for your organisation. So what are the Cisco CMR Hybrid capabilities? Cisco CMR Hybrid provides you with business quality video and web conferencing, with a consistent experience across mobile, desktop or room systems, from the browser to the boardroom. With a very broad endpoint and client support – including Cisco video conferencing and collaboration endpoints, third party standards-based video endpoints (including Polycom and Lifesize) Cisco Jabber, Microsoft Lync 2010 and 2013 clients, and any mobile or desktop client with Cisco WebEx Meeting software. Because Cisco CMR Hybrid utilises the power of on-premise Video Conferencing and TelePresence infrastructure, you get all the benefits of Cisco CMR Premises with the added flexibility of Cisco hosted WebEx Meeting Center. As a Cisco Premier Partner holding technology specialisations in both Collaboration and Video Solutions, VideoCentric are perfectly placed to provide the expertise and support your organisation needs to efficiently, securely and effectively deploy Cisco solutions across your workforce. Whether on-premise hardware or virtualised infrastructure, cloud-based or managed services, or a hybrid solution, VideoCentric is highly experienced in deploying an end-to-end solution and can assist with design, integration, deployment and support to ensure your business can greatly improve its business outcomes with video technology. Find out more about VideoCentric’s relationship with Cisco.